You can buy a new power antenna unit for around 35 bucks, and with a little imagination make it open and close your chicken coop door. Rob from nifty-stuff.com has all the details. He's the guy who put together the electric door interlock solution I posted about last year which only closed the door whereas this power antenna will open it back up the next morning. 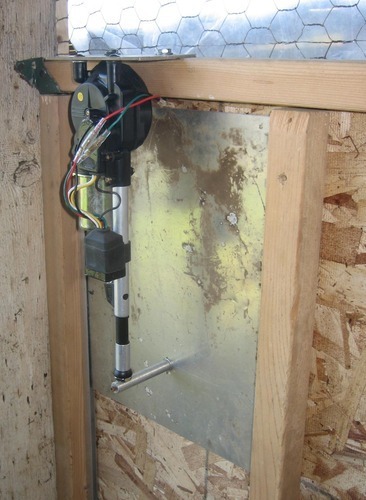 What I like about this design is how easy the installation must be compared to a few of the other do it yourself automatic chicken coop door openers out there. You'll need to supply 12 volts DC to the antenna which can be done with a 20 dollar adapter at Radio Shack. The next step is to control it with a timer or one of those gadgets that turns something on when the sun goes down and off when it comes back up. After years of research, Mark eventually settled on this automatic chicken door. You can see a summary of the best chicken door alternatives and why he chose this version here. If you're planning on automating your coop, don't forget to pick up one of our chicken waterers. They never spill or fill with poop, and if done right, can only need filling every few days or weeks!